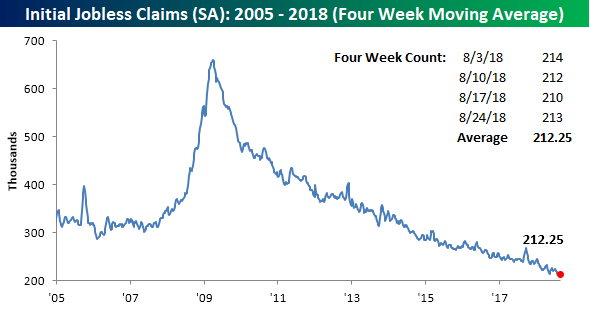 Breaking last week’s third straight week of declines, today’s initial jobless claims number came in slightly higher than expected at 213,000. Claims were estimated to rise to 212K off last week’s low reading of 210K. As we have been mentioning the past few weeks, even with this week’s increase in claims, we are still in the midst of multiple impressive streaks. 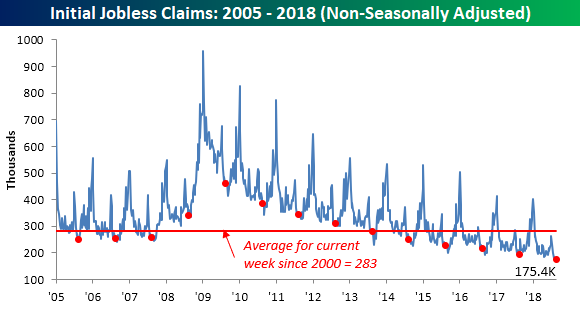 Claims have now been at or below 300K for 182 weeks, at or below 250K for 47 weeks (longest streak since January 1970), and at or below 225K for 8 straight weeks (longest since 1969). Despite the very small uptick in claims, we saw a decrease in the seasonally adjusted 4-week moving average to 212.25K. This 1.5K decline from last week’s 213.75K brought the average to its lowest level since December 13, 1969 when the report had a reading of 210.75K. Additionally, this is the lowest level of this indicator for the current cycle, surpassing May’s low. 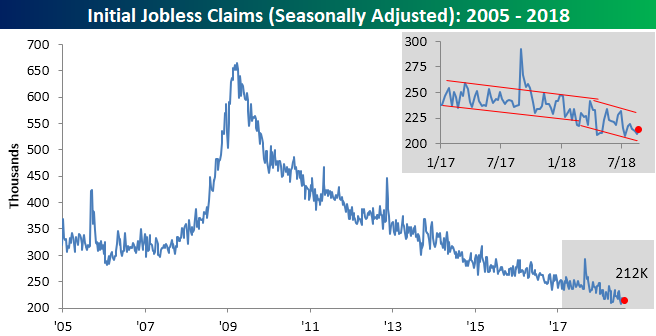 On a non-seasonally adjusted (NSA) basis, jobless claims rose to 175.4K. While up from last week, they are still more than 100K below the average for the current week since 2000.